What Is DD Form 2642? 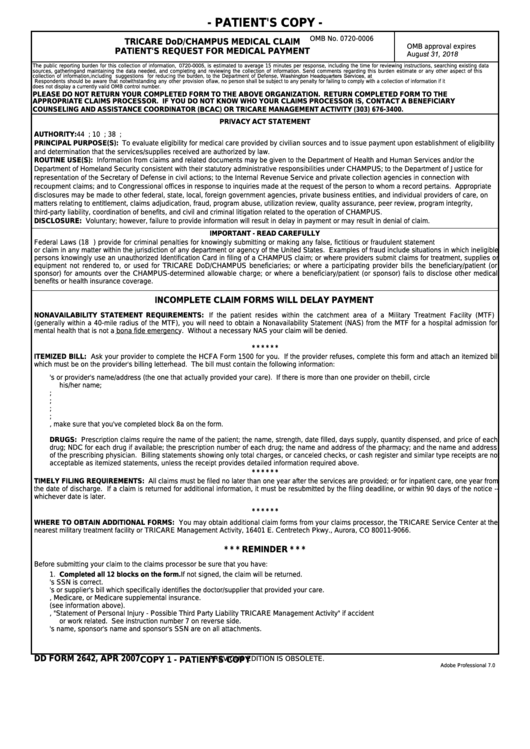 DD Form 2642, TRICARE DoD/CHAMPUS Medical Claim - Patient's Request for Medical Payment is used for evaluating eligibility for medical care provided by civilian sources. Beneficiaries can get the DD 2642 claim form through a TRICARE Regional Contractor, from a military hospital or directly from the TRICARE website. In most cases, your provider will file the claim and you'll get an explanation of benefits showing what was paid. Sometimes, you'll need to file your own claims (i.e. when traveling or getting care from a non-participating provider). DD Form 2642 is often incorrectly referred to as DA Form 2642. The form was last revised on April 2007 - a fillable up-to-date version is available below. How to Fill Out DD Form 2642? Carefully fill out your claim before mailing the paperwork to the claims processor. Incomplete forms or claims without signatures will be returned. Be sure that you have attached your provider's or supplier's bill that identifies the professional that provided your care. Check that the sponsor's Social Security number is correct. For accidents or work-related injuries attach DD Form 2527, Statement of Personal Injury - Possible Third Party Liability to your claim. Make sure all names and Social Security numbers featured on all attachments are correct. Attach an Explanation of Benefits if you have any other health insurance. Remember that all claims must be filed within a year after they had been provided or within a year from hospital discharge in cases of inpatient care. Where To Send DD Form 2642? West Region - Health Net. Detailed information is available at www.tricare-west.com or by calling 1-844-866-9378. East Region - Humana Military. Call 1-800-444-5445 or visit www.tricare-east.com for more information. Your claims must be sent to the address where the care was received. File your claims online at the TRICARE Overseas Beneficiary Portal. 3. For care received through the Continued Health Care Benefit Program (CHCBP) send the claims to the CHCBP claims processor at CHCBP Claims, P.O. Box 7981 Madison, WI 53707-7981. DD Form 2527, Statement of Personal Injury - Possible Third Party Liability allows TRICARE costs to be reimbursed through the Federal Medical Recovery Act in cases when the accident or injury was not your fault. CMS Form 1500, Health Insurance Claim Form is used to report medical claims prepared and submitted by most physicians and suppliers for medical and other health-related services.